Cut the turnips from the greens and trim each end. Toss with 1 Tbsp EVOO, 2-3 sprigs of fresh thyme and 1/2 tsp salt in a large bowl. Spread out in a single layer onto a baking sheet and roast for 20 minutes, turning over at the 10-minute mark, and remove to cool. Meanwhile in a soup pot, heat leeks, garlic, remaining 1/2 tsp salt, 1/8 tsp Chinese Five Spice Powder and butter over medium-low heat. 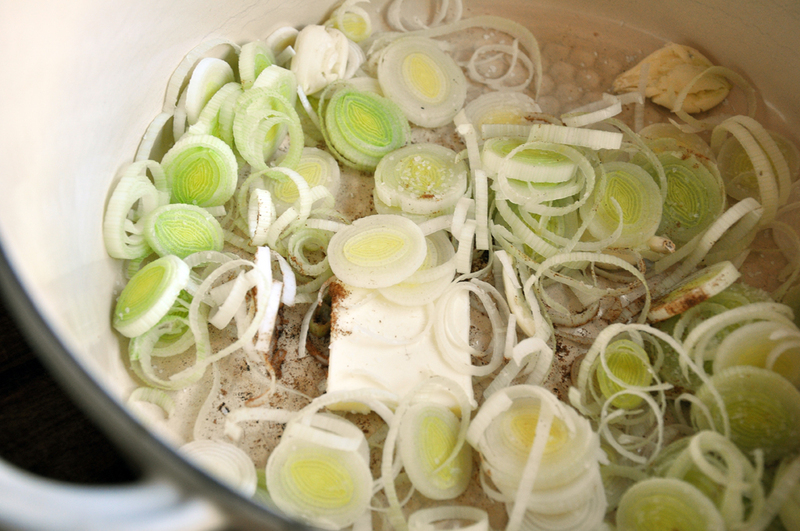 Stir every few minutes and make sure the leeks get no brown on them. Cook down until turnips are ready, about 15-20 minutes total. When turnips are done, discard the thyme sprigs and add them to the leeks. 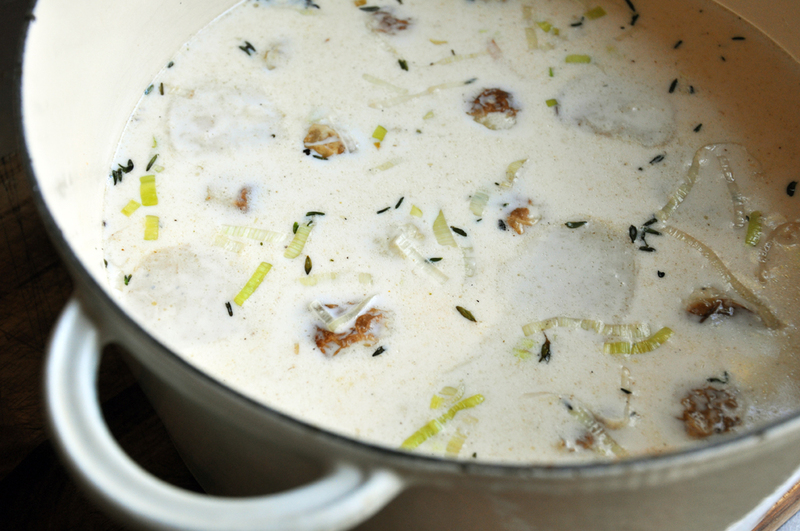 Add the potatoes, stock and half-and-half as well. Watch a short video on how to choose potatoes. Bring to a boil over medium-high heat, then turn to medium-low and simmer 20 minutes until the potatoes are very soft. Meanwhile, remove the stems from the turnip greens and chop coarsely. In a skillet over medium heat, add remaining 1/2 Tbsp EVOO. When the EVOO is hot, add greens, 1/2 tsp chopped thyme and a pinch of Chinese Five Spice Powder. Cook the greens down until tender and remove from the heat. 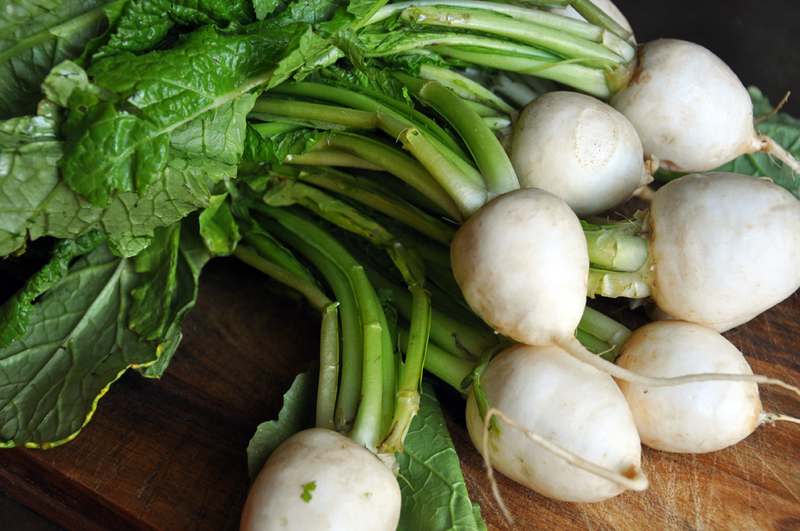 Watch a short video on my turnip green FAIL and recovery. 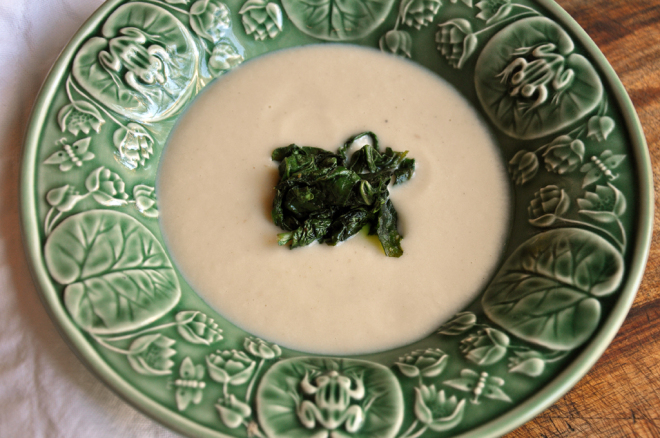 Remove the soup from the heat and puree in batches in a blender or food processing until very smooth. BE CAREFUL WITH HOT LIQUIDS! Strain through a colander or chinoise and add the vinegar. Adjust any seasonings and serve hot with a portion of greens on top.